A few days ago I was interviewed by a student journalist for the UMass Amherst student newspaper, the Daily Collegian. I agreed to the interview, since the topic was on transportation and the environment, a theme that I have written a lot about and am very passionate about. The interview focused specifically on public transit and its role in reducing emissions (and congestion, I might add). As someone, who did not get her license until she became a Full Professor and mother, I have always enjoyed using different modes of transportation, including public transportation. Growing up in Yonkers, New York, we would walk for miles, ride busses, and sometimes take the train to NYC along the Hudson River. I would ride the subway from the Bronx into Manhattan and back regularly. During my international travels, I always pay attention to the transportation infrastructure in different countries and make a point of taking public transit. Frankly, I enjoy the social aspects of public transit -- seeing different people from all walks of life. Last Friday and Saturday, I was in Cambridge and Boston and taking the Red Line from Harvard Square to Park Street always takes my breath away as we approach the Charles MGH station with the gorgeous water views. I also got a chance to ride the Green Line. The article in the Daily Collegian, entitled: UMass Transit encourages students, residents, to hop on for climate change, by Tim Jones was published today. 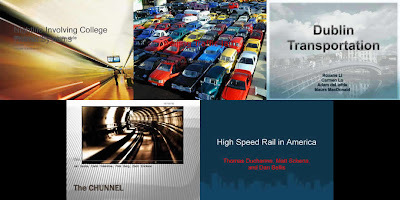 Jones did an excellent job of capturing the major issues and the importance of having more transit alternatives available that reduce carbon emissions. You can read the article here. So do take a more environmentally-friendly mode of transportation, whenever you can, and do it not just for yourself but for future generations. You may even meet some really nice people en route. 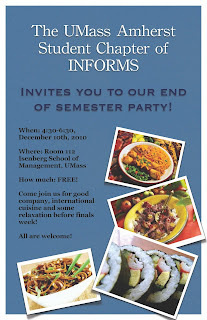 Join Us for the Northeast INFORMS Conference at UMass Amherst in 2011! This should be an outstanding venue for the exchange of the latest research of faculty, students, and practitioners in operations research/management sciences in different industries. Please check this website often as details are added in the coming months! Dr. Hari Balasubramanian of the Mechanical and Industrial Engineering Department at UMass Amherst is the General Chair and Dr. Les Servi of MITRE and Dr. Tamas Terlaky of Lehigh University are the Program Co-Chairs. I will be serving on the Program Committee and Dr. Rina Schneur of Verizon Labs and Dr. Cynthia Barnhart of MIT are on the Advisory Committee. 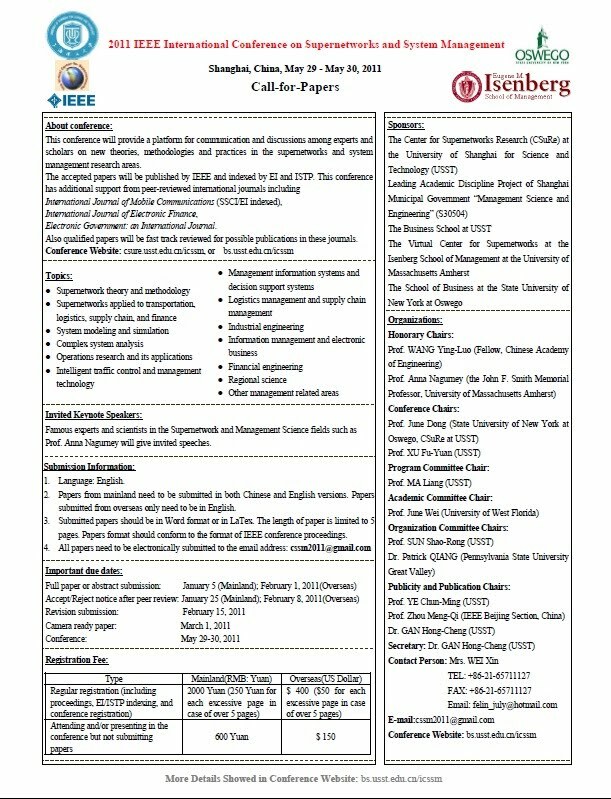 Below is the Call for Papers. Join us for the INFORMS Northeastern Conference, the fifth in a series of regional conferences. The goal of this meeting is to facilitate communication among OR/MS academics (students and faculty) and practitioners around current research and applied work. 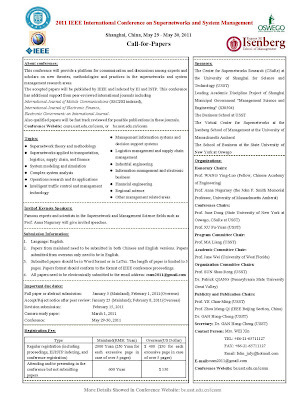 Academics and practitioners in the U.S. northeastern region are strongly encouraged to attend and present. While we anticipate that most attendees will come from the U.S. northeastern region, attendees from across the country and beyond are warmly welcomed. 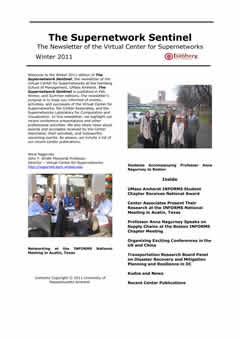 We invite you to submit a paper to the INFORMS Northeastern Conference. Submissions can be made online on our Abstract Submission page found at: http://meetings.informs.org/RegionalNortheastern2011/Abstract-Submission. All attendees, including speakers and session chairs, must register and pay the registration fee. If you need an early confirmation for visa or budgetary reasons, please indicate this in the "Comments" field on the online form. Abstracts received by the submission deadline will receive preference in scheduling. We will continue to accept contributed abstracts after February 18 as long as space is available on the program. We encourage you to submit early. Once the preliminary program has been finalized and posted on the Web, all speakers will receive an e-mail directing them to the online program for the date and time of their presentation, registration info, A/V info, and other speaker guidelines. 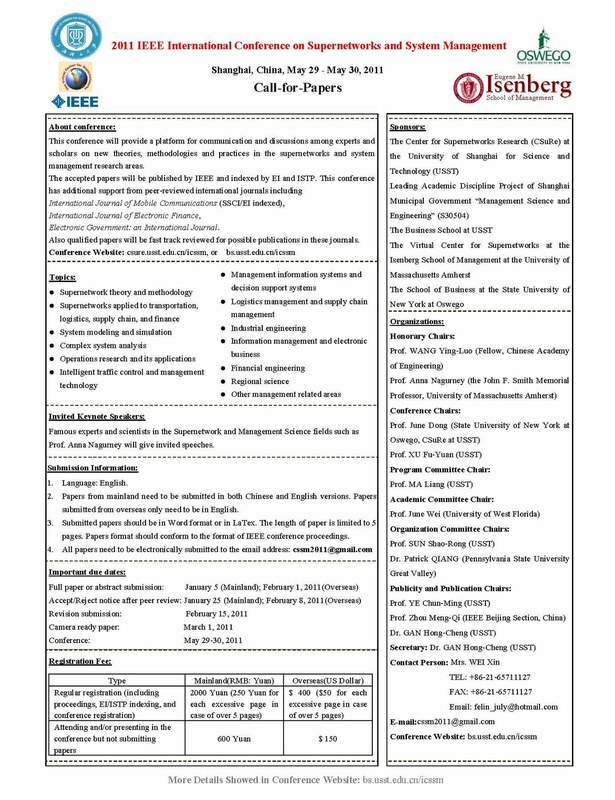 For further information on submitting papers, contact Les Servi or Tamas Terlaky. The online preliminary program will be updated regularly. You can search easily on keywords, authors, clusters, and sessions. You can also create a personalized itinerary. All meeting attendees will receive a printed copy of the final program at the meeting. We strongly encourage undergraduate and graduate student participation in the conference. To spur this activity, we plan to hold a student poster session and competition. Cash prizes will be awarded to the best three undergraduate and three best graduate posters which will be selected by a panel of judges. This is a great opportunity for undergraduate and graduate students to present their research and meet with OR/MS academics and practitioners from the region. Students pay a reduced registration fee. Space for posters is limited; hence the organizing committee will evaluate abstracts based on clarity and content. Abstract submission for posters follows the same guidelines as for regular papers. Details about poster dimensions and availability of isles will follow. Now that Thanksgiving is over, I engage in one of my favorite activities this time of year -- the baking and distribution of holiday cookies, with help from my daughter. This year, thus far, we made a variety of delicious cookies from chocolate-dipped macaroons, to rum walnut balls, to butter sugar cookies in the shapes of holiday mittens, to cherry-decorated almond morsels, to start. The planning and completion of this major production involved numerous activities, from the shopping, to the preparation, to the grating, and the mixing, the baking, and the decorating. I very much enjoy putting into practice what I teach for a living and just before Thanksgiving I covered the critical path method and project planning in one of my classes, which was perfectly timed. The most fun of all is the assemblying of the plates with the cookies, which are festooned with colorful ribbons, along with a holiday card, and the delivery to our neighbors and friends. In the photo above are some of the cookies that we baked over several shifts! For photos of some of the delights from last year, click here. Yesterday, while many were starting their journeys home for the Thanksgiving holidays via plane, train, bus, or auto, a group of my students (graduate and even an undergraduate one) joined me in traveling to my talk at the Boston INFORMS Chapter meeting. We hired a van from UMass Transit, which came with a terrific chauffer, named Andrew, who drove us from the Isenberg School via Route 2 to the venue for the meeting, Emptoris, which is in Burlington, MA. We met at 4PM and arrived at our destination, even with a pitstop, in less than 2 hours. My host, Dr. Les Servi of the MITRE Corporation, greeted everyone with stacks of pizza and refreshments at the reception, which began at 6:30PM, introduced the Boston Chapter and highlighted its upcoming activities. We are very excited that UMass Amherst will be the site for the Regional INFORMS conference, which will take place May 5-6, 2011. Dr. Servi is a program co-chair of the conference and I have agreed to serve on the program committee. My colleague, Dr. Hari Balasubramanian of the Department of Mechanical and Industrial Engineering at UMass Amherst, is the conference chair. The tentative theme of the conference is: From Theory to Practice with the goal being of having 50-50 participation by industry practitioners and academics, which would be fantastic. Dr. Servi and I go back to Brown University days, since we both received undergrad and Master's degrees in Applied Math there (he then went on to Harvard and I got my PhD at Brown) and we are very active members of the professional society INFORMS (Institute for Operations Research and the Management Sciences). My presentation was entitled: "Supply Chain Networks: Challenges and Opportunities from Analysis to Design," and it may be downloaded (in pdf format) here. The presentation gave an overview of some of the exciting supply chain projects that we have been involved in with applications ranging from electric power supply chains in New England to healthcare supply chains for critical needs products, from vaccines to medicines, as well as blood supply chains. It was terrific to mingle with the audience, which included practitioners from many different industries in the Boston area. I enjoyed talking with employees of Oracle, BAE Systems, and Fidelity Investments after my presentation. Time was too short, though, and Andrew, our driver, was waiting for us. We made it back safely to Amherst at 10:30PM. It is always so interesting to observe and see how those in positions of "substance" behave and act, especially when it comes to those that they oversee or who may report to them. create opportunities that build up people and an organization rather than use tactics that "divide and destroy;"
add humor and spirit to daily interactions. As people move up (and down) the hierarchies of various organizations, institutions, corporations, and even universities, great leaders are those that will be followed because they took the time to acknowledge others. One cannot be successful by doing it alone. I will be speaking next Tuesday evening (right before the Thanksgiving rush) in the Boston INFORMS Chapter Speaker Series. I am very much looking forward to giving my talk, Supply Chain Networks: Challenges and Opportunities from Analysis to Design. The talk will take place at Emptoris. My hosts will be Dr. Les Servi of MITRE (a fellow Brown University alum with two degrees in Applied Math and a Harvard PhD and long-standing, very active member of INFORMS) and Dr. Olga Raskina of Emptoris (a Columbia University PhD). More information on my talk and the venue is available here. This week we are celebrating International Week at the Isenberg School and our atrium is festooned with flags of different countries as featured above. There are also special activities planned this week to commemorate different countries and international experiences. And today's Boston Globe is reporting that Massachusetts is one of the top states attracting international students for education, with Boston University, MIT, Harvard, Northeastern, and the University of Massachusetts Amherst, being the leading such universities within the state! Speaking about international experiences, I very much enjoyed the interview on NPR by Ira Flatow with the new NSF Director, Dr. Subra Suresh. In the interview, the transcript of which is available here, Dr. Suresh said: I've been fortunate to have had the experiences that I've had, having been born abroad. And here is the basic truth related to that: Science has no borders, no boundaries, and science is nonpartisan. If you look at the United States, more than half of all the American Nobel laureates in the last 60 years were born abroad. He also spoke about the importance of collaborations and in bringing different disciplines together to solve the most difficult problems whether in clean energy or transportation (I concur)! The US continues to be a mecca for education but it is essential that researchers have the support necessary to make fundamental discoveries and breakthroughs. Research requires uninterrupted time for intense work and concentration.